The oldest yacht in our collection of the most expensive sailing superyachts for sale has an intriguing history. Launched in 1902, Shenandoah of Sark's century of life afloat has seen her confiscated by the British Navy during the First World War, bought by Italian prince Spado Veralli and renamed several times. Refit in 1998, and again in 2009, the interior styling by Gae Aulenti and Bureau Veritas is a fine blend of traditional and contemporary design. She has accommodation for 10 guests in one master and three double cabins with two Pullman berths. 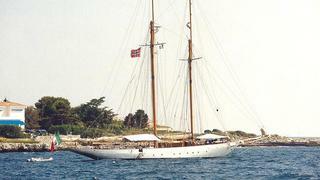 Shenandoah of Sark is for sale in immaculate condition and asking €15,000,000 with Edmiston & Company. The oldest yacht in our collection of the most expensive sailing superyachts for sale has an intriguing history. Launched in 1902, Shenandoah of Sark's century of life afloat has seen her confiscated by the British Navy during the First World War, bought by Italian prince Spado Veralli and renamed several times. Refit in 1998, and again in 2009, the interior styling by Gae Aulenti and Bureau Veritas is a fine blend of traditional and contemporary design. She has accommodation for 10 guests in one master and three double cabins with two Pullman berths. 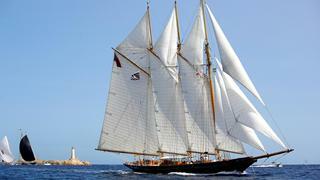 Shenandoah of Sark is for sale in immaculate condition and asking €15,000,000 with Edmiston & Company. It's not just her fame that makes Orion of the Seas one of the most expensive sailing superyachts for sale right now. Previously owned by Charles Nicholson, she was launched in 1910 by the Camper & Nicholsons yard and went on to become one of the most iconic classic sailing superyachts of all time. After being fully rebuilt in 2005, Orion of the Seas is once more guaranteed to be one of the most striking vessels in any port. During the refit of this 49.29 metre sailing yacht, the hull planking was removed and the bare steel frames were re-galvanised and painted. The massive teak and iroco planks were then reattached and her interior was fully restored; with the original fittings and fixtures being retained wherever possible. Orion of the Seas is asking for €16,500,000 with Edmiston & Company. It's not just her fame that makes Orion of the Seas one of the most expensive sailing superyachts for sale right now. Previously owned by Charles Nicholson, she was launched in 1910 by the Camper & Nicholsons yard and went on to become one of the most iconic classic sailing superyachts of all time. After being fully rebuilt in 2005, Orion of the Seas is once more guaranteed to be one of the most striking vessels in any port. During the refit of this 49.29 metre sailing yacht, the hull planking was removed and the bare steel frames were re-galvanised and painted. The massive teak and iroco planks were then reattached and her interior was fully restored; with the original fittings and fixtures being retained wherever possible. Orion of the Seas is asking for €16,500,000 with Edmiston & Company. Not due for delivery until 2018, the new build Admiral Wave 38, currently for sale, is the second hull of the Italian Sea Group’s range of superyachts designed by Philippe Briand. With a lightweight aluminium hull, carbon rig, lifting keel and a large sail area, this 38 metre sloop will be highly competitive on the superyacht regatta circuit. But with a beamy hull and a wider aft section, she has plenty of deck space and uncommon volumes inside, making her perfect for entertaining and hosting guests. Her layout envisages a large master suite, two guest suites and a multifunction space that can be an office, a saloon or an extra cabin. The Admiral Wave 38 is asking €16,600,000 with Camper & Nicholsons International and Northrop & Johnson. Not due for delivery until 2018, the new build Admiral Wave 38, currently for sale, is the second hull of the Italian Sea Group’s range of superyachts designed by Philippe Briand. With a lightweight aluminium hull, carbon rig, lifting keel and a large sail area, this 38 metre sloop will be highly competitive on the superyacht regatta circuit. But with a beamy hull and a wider aft section, she has plenty of deck space and uncommon volumes inside, making her perfect for entertaining and hosting guests. Her layout envisages a large master suite, two guest suites and a multifunction space that can be an office, a saloon or an extra cabin. The Admiral Wave 38 is asking €16,600,000 with Camper & Nicholsons International and Northrop & Johnson. 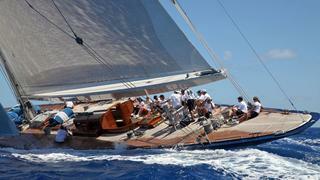 Heritage is a 45.3 metre luxury sloop built by Perini Navi in 2006. She has a steel hull, lightweight aluminium superstructure, and a cutter rig; balancing strength and durability, with exhilarating performance. Heritage is now for sale and, with only one owner since she was launched, she’s in immaculate condition. She has a large saloon, a well appointed master suite, a VIP stateroom and three twin cabins with a Pullman berth. Heritage is asking €17,500,000 with Fraser Yachts. 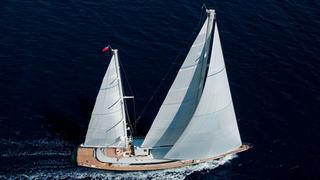 Heritage is a 45.3 metre luxury sloop built by Perini Navi in 2006. She has a steel hull, lightweight aluminium superstructure, and a cutter rig; balancing strength and durability, with exhilarating performance. Heritage is now for sale and, with only one owner since she was launched, she’s in immaculate condition. She has a large saloon, a well appointed master suite, a VIP stateroom and three twin cabins with a Pullman berth. Heritage is asking €17,500,000 with Fraser Yachts. Sailing superyacht Lady B is for sale, combining contemporary style and comfort, with fast, high-performance sailing. Her popular design features include a two-person crow’s nest 39 metres up the mast, and a stunning, curved skylight in the master suite that leads to a private cockpit. The Rhoades Young interior of this 44.7metre yacht has a light, airy feel with a beautiful, split level saloon. Lady B's slim full-aluminium superstructure keeps weight low and reduces windage and her carbon fibre mast and furling boom is equipped with PBO standing rigging to enhance performance. Lady B is asking €17,900,000 with Burgess. Sailing superyacht Lady B is for sale, combining contemporary style and comfort, with fast, high-performance sailing. Her popular design features include a two-person crow’s nest 39 metres up the mast, and a stunning, curved skylight in the master suite that leads to a private cockpit. The Rhoades Young interior of this 44.7metre yacht has a light, airy feel with a beautiful, split level saloon. Lady B's slim full-aluminium superstructure keeps weight low and reduces windage and her carbon fibre mast and furling boom is equipped with PBO standing rigging to enhance performance. Lady B is asking €17,900,000 with Burgess. Endeavour is currently for sale, offering sailing fanatics the chance to own the prestigious J Class yacht that famously challenged Ranger in the 1934 America's Cup. It's easy to see why this 39.56 metre is one of the most expensive sailing yachts for sale right now, having been painstakingly restored by Elizabeth Meyer in the late 1980s and lovingly kept since. Built by Camper & Nicholsons in 1934, no expense was spared to make Endeavour the finest vessel of her day. She pioneered the Quadrilateral genoa, a two clewed headsail offering an immense sail plan still used on J Class yachts racing today. In 1989 she was completely rebuilt by Royal Huisman and fitted with all new deck, rig, sailing gear and interior. In 2011, she was completely refitted to make her once more one of the finest sailing yachts in the world. Endeavour is asking €19,950,000 with Edmiston & Company. Endeavour is currently for sale, offering sailing fanatics the chance to own the prestigious J Class yacht that famously challenged Ranger in the 1934 America's Cup. It's easy to see why this 39.56 metre is one of the most expensive sailing yachts for sale right now, having been painstakingly restored by Elizabeth Meyer in the late 1980s and lovingly kept since. Built by Camper & Nicholsons in 1934, no expense was spared to make Endeavour the finest vessel of her day. She pioneered the Quadrilateral genoa, a two clewed headsail offering an immense sail plan still used on J Class yachts racing today. In 1989 she was completely rebuilt by Royal Huisman and fitted with all new deck, rig, sailing gear and interior. In 2011, she was completely refitted to make her once more one of the finest sailing yachts in the world. Endeavour is asking €19,950,000 with Edmiston & Company. Silvana is a 56 metre luxury sailing yacht, custom built for private family and charter use. With just one owner, Silvana is offered for sale in immaculate condition. Built by Perini Navi in 2008, with naval architecture by Ron Holland, Silvana benefits from an ultra-light streamlined aluminium hull and twin aluminium masts with a carbon fibre furling boom. 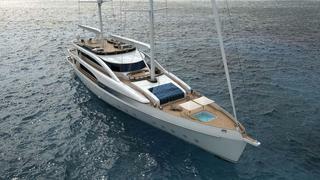 She has a sail plan of 1,500 square metres, and she can cruise at a comfortable 13 knots with a range of 3,600nm. Silvana has plenty of outside space, a Jacuzzi and diving platform. Her interior, elegantly styled in classic light oak with textured leather accents, can accommodate 12 guests in five elegant and refined staterooms. Silvana is asking €24,000,000 from Camper & Nicholsons International. Silvana is a 56 metre luxury sailing yacht, custom built for private family and charter use. With just one owner, Silvana is offered for sale in immaculate condition. Built by Perini Navi in 2008, with naval architecture by Ron Holland, Silvana benefits from an ultra-light streamlined aluminium hull and twin aluminium masts with a carbon fibre furling boom. She has a sail plan of 1,500 square metres, and she can cruise at a comfortable 13 knots with a range of 3,600nm. Silvana has plenty of outside space, a Jacuzzi and diving platform. Her interior, elegantly styled in classic light oak with textured leather accents, can accommodate 12 guests in five elegant and refined staterooms. Silvana is asking €24,000,000 from Camper & Nicholsons International. The new build Mondo Marine SM45 is designed to offer sailing enthusiasts the capacity and volume of motor yachts in a sailing superyacht. Currently for sale, the SM45 has a light weight, all-aluminium build and her ketch rigging is intended for ease-of-use; she can easily be sailed without a large or experienced crew. The 47 metre yacht has 850 square metres of sail and an adjustable-pitch propeller that can be flipped up when the engine isn’t running to reduce drag. The SM45 has outside and interior spaces of a similar size to those of a motor yacht, with a range of customisation options for her owner, including layout, decoration, and amenities tweaks. The suggested layout includes a main deck owner’s suite with a balcony, four guest staterooms and an on-deck Jacuzzi. The SM45 is asking €25,000,000 with Northrop & Johnson. The new build Mondo Marine SM45 is designed to offer sailing enthusiasts the capacity and volume of motor yachts in a sailing superyacht. Currently for sale, the SM45 has a light weight, all-aluminium build and her ketch rigging is intended for ease-of-use; she can easily be sailed without a large or experienced crew. The 47 metre yacht has 850 square metres of sail and an adjustable-pitch propeller that can be flipped up when the engine isn’t running to reduce drag. The SM45 has outside and interior spaces of a similar size to those of a motor yacht, with a range of customisation options for her owner, including layout, decoration, and amenities tweaks. The suggested layout includes a main deck owner’s suite with a balcony, four guest staterooms and an on-deck Jacuzzi. The SM45 is asking €25,000,000 with Northrop & Johnson. Asahi, currently for sale, is an award-winning sailing superyacht that embodies a natural aesthetic with a high performance, contemporary design. Her extensive teak sun deck and flybridge provide ample space, and the perfect setting, for relaxation and entertaining. The interior by Remi Tessier provides refined luxury - showcasing the designer's cabinet making pedigree with extensive use of mahogany, wenge, ebony and textured leather. But Asahi is not to be underestimated on the regatta circuit. 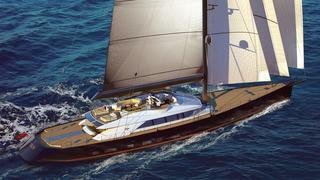 She benefits from an ultra-light build, with a carbon fibre, automatic furling boom and aluminium superstructure. Together with her streamlined, full aluminium hull and 1,500 square metres of sail, she can reach speeds of 15.5 knots. The seventh of Perini Navi’s 56 metre Sailing Series, in 2010 Asahi won Best 45m+ Sailing Yacht at the World Superyacht Awards, just one of the many accolades she has collected for her distinctive design, style, and naval architecture. Asahi is asking €26,900,000 with Perini Navi. Asahi, currently for sale, is an award-winning sailing superyacht that embodies a natural aesthetic with a high performance, contemporary design. Her extensive teak sun deck and flybridge provide ample space, and the perfect setting, for relaxation and entertaining. The interior by Remi Tessier provides refined luxury - showcasing the designer's cabinet making pedigree with extensive use of mahogany, wenge, ebony and textured leather. But Asahi is not to be underestimated on the regatta circuit. She benefits from an ultra-light build, with a carbon fibre, automatic furling boom and aluminium superstructure. Together with her streamlined, full aluminium hull and 1,500 square metres of sail, she can reach speeds of 15.5 knots. The seventh of Perini Navi’s 56 metre Sailing Series, in 2010 Asahi won Best 45m+ Sailing Yacht at the World Superyacht Awards, just one of the many accolades she has collected for her distinctive design, style, and naval architecture. Asahi is asking €26,900,000 with Perini Navi. 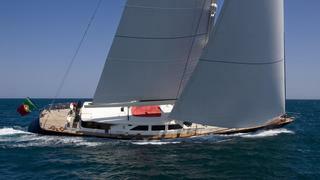 50.24 metre sailing superyacht Troy is one of the most expensive for sale. A truly striking sloop, she features naval architecture by Dysktra, and is designed for high performance sailing, with a carbon mast, boom and superstructure, and 2,638 square metres of Elvstrom Sails. Troy's teak deck and glass panelling combine the best of traditional and contemporary materials, with a curated design highlighted with bespoke artworks. She can accommodate up to 12 guests in five well-lit, airy and beautifully furnished state rooms. Troy is asking €29,500,000 with Northrop & Johnson. 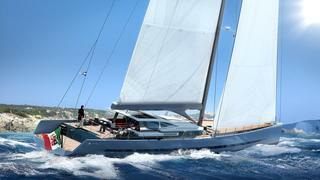 50.24 metre sailing superyacht Troy is one of the most expensive for sale. A truly striking sloop, she features naval architecture by Dysktra, and is designed for high performance sailing, with a carbon mast, boom and superstructure, and 2,638 square metres of Elvstrom Sails. Troy's teak deck and glass panelling combine the best of traditional and contemporary materials, with a curated design highlighted with bespoke artworks. She can accommodate up to 12 guests in five well-lit, airy and beautifully furnished state rooms. Troy is asking €29,500,000 with Northrop & Johnson. Marie is for sale and she presents a rare opportunity to own a yacht that is classic in every sense of the word. Replete with sails, antique furnishings and even functioning cannons, this 56.4 metre sailing superyacht is as unique as she is beautiful. Despite her outwardly classic style Marie features the latest sailing superyacht technology: her carbon fibre masts can carry up to 3,300 square metres of sail, she has in-boom furling systems for both main and mizzen sails and uses the latest rigging technology. Marie is for sale with Fraser Yachts and Hoek Brokerage. Marie is for sale and she presents a rare opportunity to own a yacht that is classic in every sense of the word. Replete with sails, antique furnishings and even functioning cannons, this 56.4 metre sailing superyacht is as unique as she is beautiful. Despite her outwardly classic style Marie features the latest sailing superyacht technology: her carbon fibre masts can carry up to 3,300 square metres of sail, she has in-boom furling systems for both main and mizzen sails and uses the latest rigging technology. Marie is for sale with Fraser Yachts and Hoek Brokerage. 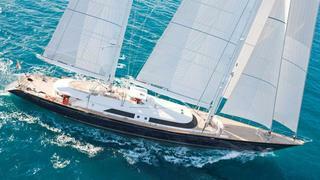 Perini Navi’s 56 metre Melek is the most expensive sailing superyacht for sale right now, asking €34M. She has two aluminium masts, with carbon fibre booms, and a sail plan of approximately 1,500 square metres. Melek was launched in 2010 as one of the very popular Perini 56 metre series. She combines traditional craftsmanship with modern innovation. Her cherry, walnut and leather interior provides luxurious comfort, whether racing along at 15.5 knots, or cruising for up to 3,600nm. 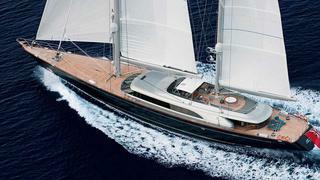 Melek is asking €34,000,000 with Perini Navi. 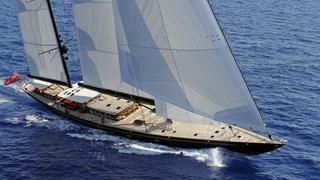 Perini Navi’s 56 metre Melek is the most expensive sailing superyacht for sale right now, asking €34M. She has two aluminium masts, with carbon fibre booms, and a sail plan of approximately 1,500 square metres. Melek was launched in 2010 as one of the very popular Perini 56 metre series. She combines traditional craftsmanship with modern innovation. Her cherry, walnut and leather interior provides luxurious comfort, whether racing along at 15.5 knots, or cruising for up to 3,600nm. 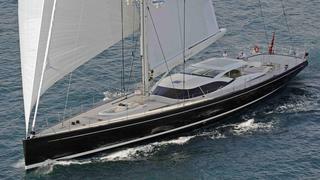 Melek is asking €34,000,000 with Perini Navi.